This is the 3rd in a series of 8 articles on product finding that draw on findings from our recent homepage and category usability report and benchmark. While breadcrumbs may seem like a pretty uninteresting site element, during our recent Homepage & Category Usability study they proved themselves to be vital navigation paths. Perhaps more interesting is that the study revealed that e-commerce sites should offer 2 types of breadcrumbs: both hierarchy-based and history-based breadcrumbs. Yet, when benchmarking 50 major e-commerce sites we found that a staggering 68% suffer from sub-par breadcrumb implementations: 45% have only one type of breadcrumb (typically hierarchy-based, lacking the history-based), and 23% don’t have breadcrumbs at all. Some of the 68% of top e-commerce sites with sub-par breadcrumb implementations. In this article we’ll go over the findings from our research study, outlining the characteristics of both history-based and hierarchy-based breadcrumbs, and discuss why it’s important for e-commerce sites to have both. Without breadcrumbs on the product page, it’s difficult for users to efficiently browse a collection of products because there’s no way to go “one step up” in the hierarchy (to the product category), or return to a previous product list or search results page. This often forces users to make drastic scope jumps (e.g. select a top-level category, perform a search, etc.) or remain stuck at the product page. With breadcrumbs, however, any user who doesn’t find the product to be a good match or simply wants to see other products (for comparison, due diligence, or additional purchases) can use the breadcrumbs to seamlessly traverse up the site hierarchy and in this way continue their product browsing instead of having to resort to drastic scope jumps. Hierarchy-based breadcrumbs enable users to easily navigate to a product’s category to find related products. 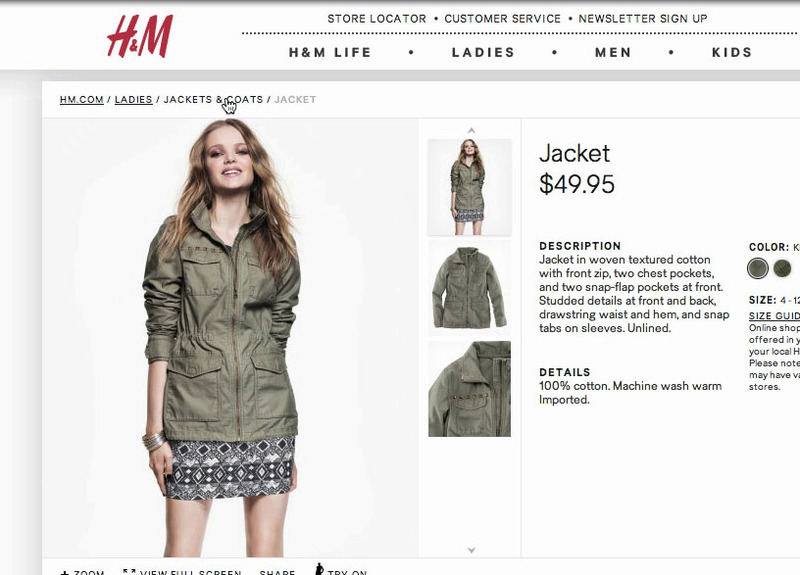 Here a test subject isn’t 100% sure about the jacket, so she easily navigated to the “Jackets & Coats” category she came from using the hierarchy-based breadcrumb links at H&M’s product page. During testing the most common usage of breadcrumbs was as a way to return to the category the test subject just came from – much like using the browser’s “Back” button, only this is part of the webpage’s interface. In this sense, breadcrumbs are essentially an easy way for users to return to the product category and continue their product browsing, jumping back and forth between product page and product list. Alas, breadcrumb links often don’t work like the browser “Back” button as they are typically hierarchy-based, whereas the web browser’s “Back” button is history-based (that is, it’s based on the user’s navigation path). Consequently, any previously applied filters and sorting options are lost when the user navigates back using a hierarchy-based breadcrumb. This is where history-based breadcrumbs enter the picture. When the breadcrumb is history-based it sends the user back to their previous page, which is often not the plain category list – for example the user may have filtered by a product attribute or applied a different sorting direction, or maybe even entered the product page in a non-linear fashion, such as search (on-site as well as off-site) or an ad. 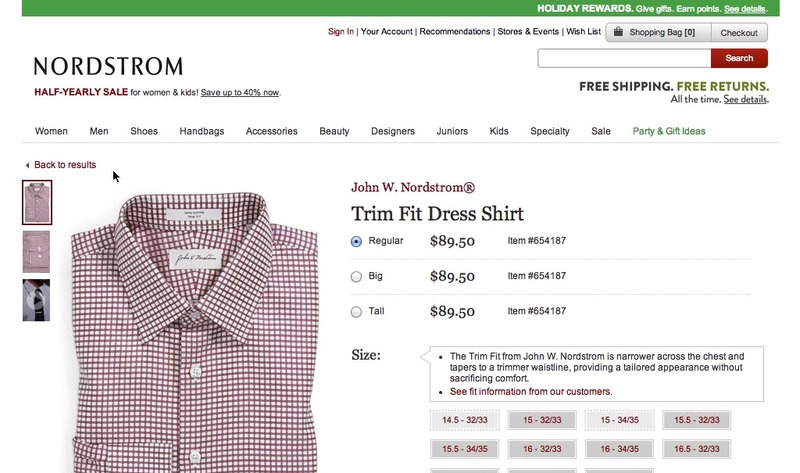 At Nordstrom, a “Back to results” option allows the user to return to the product list with all previous filtering and sorting settings intact (and it works for search too). However, the lack of the traditional hierarchy-based breadcrumbs makes it difficult for users from external sources to infer or jump scope (i.e. traverse “back up” the catalog hierarchy). A few sites implement breadcrumbs that are based solely on the user’s navigation path (i.e. history-based breadcrumbs), effectively functioning as “back” links. However, this limits the user’s ability to explore scopes they’ve accessed in a non-linear fashion as they can’t shift to a linear browsing strategy by traversing up through the categories the product is placed in. Users who land on a product page in a non-linear fashion (e.g., from an internal or external search, or from a featured promotion) will often use breadcrumbs to see other products in the same sub-category. It’s essentially a way for the user to find related products despite accessing the product from a completely different part of the site or even from another site altogether. Hierarchy breadcrumbs are therefore hugely important to search, promotions and other non-linear paths, as it enables the user to easily switch to a linear product-browsing strategy if the scope is relevant to them. At Best Buy, a subject opened a Targus laptop adapter from a list of “Best Selling” accessories. However, not being 100% convinced, the subject wanted to check out other laptop adapters – luckily, this proved as easy as clicking the hierarchy-based breadcrumbs on the category page which took him directly to a “Laptop Chargers & Adapters” category. Yet while hierarchy-based breadcrumbs work well for users who accessed the product page in a non-linear fashion, they don’t always suit the needs of users who accessed the product page in a linear way. If a user has applied a number of filters on the category page and then opens a product, clicking the category in the hierarchy-based breadcrumbs on the product page will typically not retain the filters but rather send the user back to the category page with no filters applied because it’s simply a link to the category and not based on the user’s history. Meanwhile what the user really needed was a history-based breadcrumb that would send them back to their previous page – whether it be a list of search results or a category with previous filters and sorting applied. Clearly, there’s a legitimate need for both hierarchy-based and history-based breadcrumbs – so which should you implement? The answer is both. An elegant, and relatively simple solution is to have a set of hierarchy-based breadcrumbs and then append a history-based “Back to results” option at the end (or beginning). This gives the user the best of both worlds: access to categories despite accessing the product page in a non-linear way, while also providing the user a way back to their previous page with any filters, sorting and/or search queries intact. 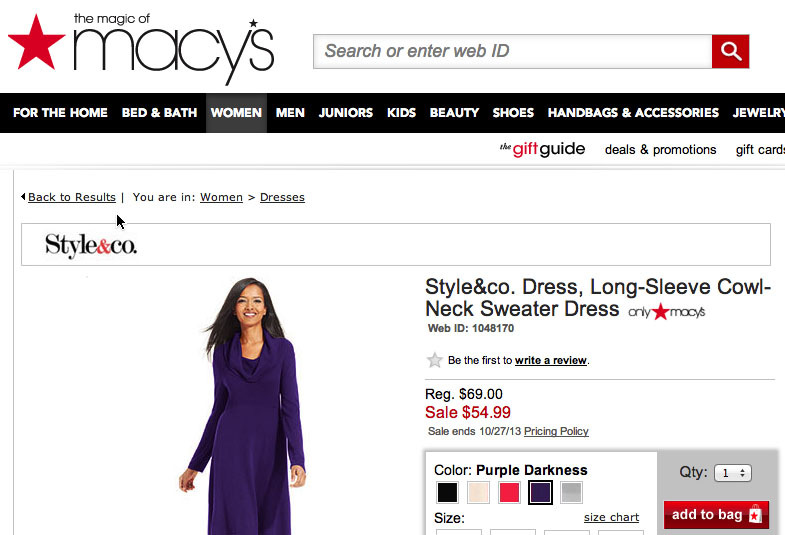 Sears and Macy’s solves the history vs. hierarchy issue of breadcrumbs by including both. A history-based “Back to results” item, which takes users back to their previous product list with all filters retained, is appended to the hierarchy-based breadcrumbs. This is a good example of a seemingly ordinary site element that can actually have a significant impact on the user’s ability to browse your site’s product catalog. By fusing hierarchy- and history-based breadcrumbs, users can change product browsing strategy and seamlessly leaf through product lists. What makes this fusion particularly interesting is that it blends site taxonomy and user behavior into a single functional element. It’s details like this that can make the difference between a site that supports rapid product browsing and shifts in product finding strategy and a site that hinders it. Authored by Jamie Appleseed. Published on December 10, 2013. Note that if counting the sites which doesn’t display both breadcrumb types at the same time (the ideal solution suggested in the article) the number goes up to 94% instead of 68%. The 26% difference are the number of sites which use a history based breadcrumb for their category navigation, and a “back to results” history-based breadcrumb for their search results - thus it’s actually 94% of the sites that have a subpar experience. This number is confirmed in our recent E-commerce Search usability benchmark (released may 2014) which put the number at 92% (i.e. only 8% display both breadcrumb types for both category navigation and search results). Always good reading your postings – And you’re once again in the right – But I see three alternatives to use breadcrumbs, which also can be mixed, regarding the individual needs / depending on the context. Thanks for the comment. Replying for Jamie. Agree with your article; breadcrumbs are no excuse for having a laxly enforced category hierarchy and taxonomy. If a site’s main nav. and category taxonomy is well implemented, they are a great addition. Great to see we have aligning test observations in regards to the user behaviour and need for inferring current scope and traversing back up the category hierarchy. In regards to the three alternatives, doesn’t “Location-based” = “hierarchy-based” and “path-based” = “history-based” ? > If a user has applied a number of filters on the category page and then opens a product, clicking the category in the hierarchy-based breadcrumbs on the product page will typically not retain the filters but rather send the user back to the category page with no filters applied because it’s simply a link to the category and not based on the user’s history. I think you’ve hit upon the correct fix but disregarded it! The point is that any different ‘view’ (so if filters are applied, for example) should have a URL associated with it. Whilst this may have been traditionally a little difficult, it’s more and more feasible now with things like Ajax and Pushstate in HTML5. If this is implemented correctly, the user can use the well-known features within the browser to go back, historically, through their journey and we have avoided reproducing browser-functionality in our designs. Hierarchy based will always be needed so users can infer their current scope etc. History-based will still be needed as the test subjects – when testing one the many sites that only had hierarchy breadcrumbs – were often observed to use the hierarchy-based breadcrumbs thinking they would take them “one step back”, i.e. function as a back-button. Having the history-based “back to results” link right before or right after the hierarchy-based breadcrumbs indicates there’s a difference between “going back” and "go one level up to the ‘running shoes category’ ". For the same reason you can experiment with having the “back to results” as a dynamic link and only show it when there actually is a difference (e.g. if user have applied filters or comes from internal search, etc.). Sorry if the article wasn’t entirely clear on this. Interesting article, Next is also a good example to look at. Not sure if we have covered the following point. If a user search’s for a product on a search engine, where by this user then click on a link leading to a ‘product detail page’. Without breadcrumbs this does not offer the user the opportunity to browse what other products are in that category or even explain to the user what category the product falls in all together. Exactly Tom, this is why hierarchy-based breadcrumbs are important to include in addition to the history-based “Back to results” link. Very smartly presented + said. I’m gonna make sure to include this navigation in my next web projects. Thanks! Thanks for the great article, I just used this technique in one of my eCommerce projects. I love to use the breadcrumbs technique in my website. An interesting post but some mix up seems apparent in your description of location and path based breadcrumbs. Location based show a hierarchical view of the website and if implemented properly have many pros for both SEO and usability. They DO NOT replicate the back button, on the contrary path based breadcrumbs actually do this. Location based breadcrumbs should remain the same regardless of journey. I understand you stating that you need both but actually the ability to have a “back to search results” page on the product page in fact should merely replicate the back button and attributes should remain filtered if the site incorporates an Ajax backend. Breadcrumbs won’t help a site answer users’ questions or fix a hopelessly confused information architecture. All that breadcrumbs do is make it easier for users to move around the site, assuming its content and overall structure make sense. That’s sufficient contribution for something that takes up only one line in the design. Breadcrumbs in sites can be small but they have big roles. These things must not taken for granted. 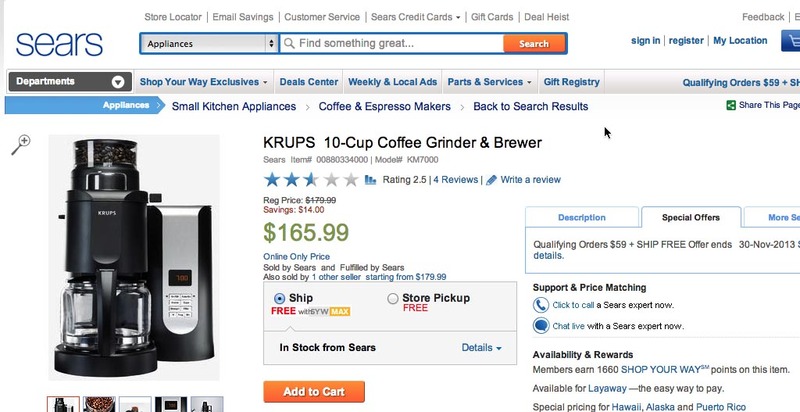 Thanks for describing hierarchy-based and history-based breadcrumbs for e-commerce. Great! Finally, I got to know how important is breadcrumbs for a successful website. I knew that hierarchy based breadcrumbs was really important, both for user experience and SEO. A real eye-opener about the historical breadcrumbs. Thanks for this! Great article. Do you have any thoughts or research on the feasibility of showing breadcrumbs or standards on showing breadcrumbs for mobile? Most of our customers are going mobile and given the smaller form factor on mobile screens, a breadcrumb line can potentially take up space equivalent to a Reviews line or pricing info. line that gets pushed below the fold. Yes we have tested PDP breadcrumbs extensively on mobile as well. On mobile breadcrumbs are actually even more important than desktop.